The World Expo is an opportunity for the host country to promote itself. A vital part of this will be done through the national pavilion, which embodies art, culture, and technology. From the Crystal Palace, created for London's Expo in 1851, to the Eiffel Tower, a remnant of Paris's 1889 World Expo. Historic architecture can still be found around the world today marking their host country's culture, technology and wisdom covering 6.5 hectares, the China Pavilion will be composed of three parts: the National Pavilion, a joint pavilion for provinces and cities, and then a third section, offering separate pavilions for Hong Kong, Macao and Taiwan. Based on the theme "Chinese wisdom in urban development", the complex embodies both traditional Chinese elements and modern life. He Jingtang, S. China Univ. of Technology, said, "We have two concerns. First, how to emphasize Chinese features, or Chinese elements? Second, Shanghai is an international city, often compared to an ocean, accepting inflow from rivers and streams. It faces the whole world. So modernity should also be embodied in the pavilion." In a tribute to its Chinese Heritage.. 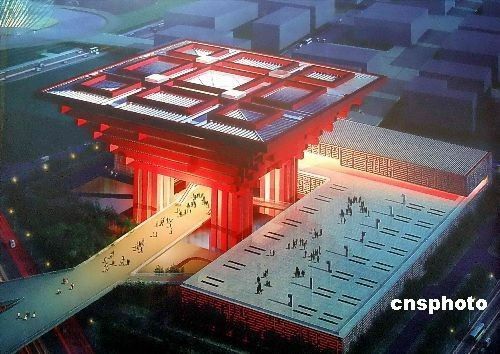 The National Pavilion will feature traditional Dougong Brackets, a construction style dating back more than 2,000 years. The wooden brackets will be fixed layer upon layer on top of columns to solidify the construction.